Summertime with our dogs is full of fun and sun for the whole family, including your dog! Our dogs get to spent time with us exploring, playing outside, and everything else that comes with summer. With the high temperatures and sometimes unbearable heat, our dogs need a way to cool off. While you could take them to the pool or turn on the sprinkler in the yard, there is a more exciting way to cool down your dog- frozen treats! 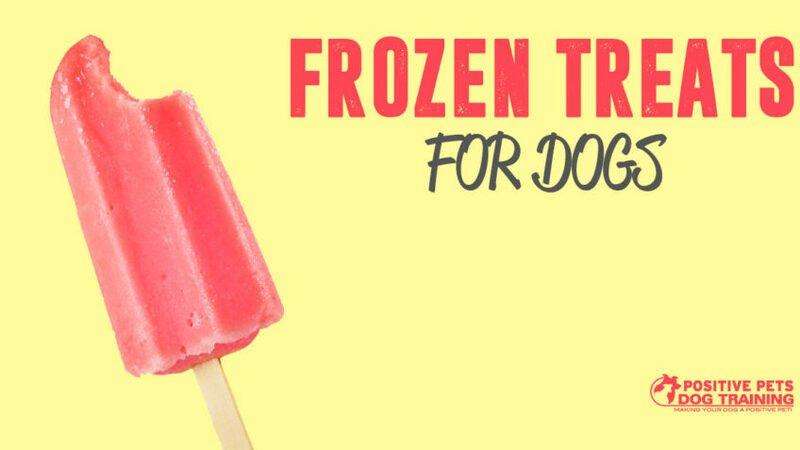 Frozen treats are a perfect way to get your dog nutrition while also giving them a way to cool down in the hot weather. Here are a few of the best recipes for frozen treats you can make at home this summer! Before you dive into making these various “pupsicles” (popsicles for your pup) you’ll need to make sure you have the proper cups or molds to make them. You want to grab either a pack of 5 oz. plastic disposable cups or you can get a popsicle mold. You can get whatever size or shape you think will be best for your specific dog and what type of pupsicle you’re making. If you want to throw something together with just a few simple ingredients, we’ve got the perfect recipe for you. All you need is 4 ingredients: 1 large frozen banana, 2 tablespoons of natural peanut butter (make sure it has no salt or sugar added), 2 tablespoons of honey, and one 17.6 ounce container of plain Greek nonfat yogurt. Blend everything except the yogurt together to create a smooth mixture, then add in the yogurt to create a milkshake texture. Pour this into each of the molds or cups. If you use cups and want to add a “stick”, use a small nylon bone that they can chew on once they each all of the treat. Freeze for about two hours. When they’re ready, dip the bottoms of the molds into hot water for 2-4 seconds. Then they’ll slip out and your dog will dig right in! This is another yummy choice for dogs that love bacon and are trying to avoid dairy like yogurt. Take 5 or 6 bananas, chop them up, and freeze them. While they’re freezing, cook up two pieces of bacon and crumble it. Once the bananas are thoroughly frozen, throw them into a blender and blend them to a smooth, soft-serve ice cream texture. When it is ready, add 3 tablespoons of creamy peanut butter and blend more. Stir in the bacon and 1/2 cup of shredded carrot. Then pour the mixture into any of your molds and freeze for a few hours. Your dog should love this yummy and savoring choice. If you want to switch it up, use the bananas and peanut butter as a base, and then add in your dog’s favorite ingredients. These are even more simple than you could imagine. If you want to use a popular summer fruit that you may have on hand, this is great choice. All you need is a watermelon and one can of coconut milk. All you do is scoop about a quarter of the melon out, blend it with the milk in a blender, and pour into your molds. If you want to add more watermelon to make the color darker, go for it. While these are great in regular molds, if you want to make them especially cute, use a bone shaped mold. We’re sure this will be a big hit. There are so many different recipes that you can try for frozen treats. Keep trying them all until you find what your dog likes best! Good luck and happy summer!